I recently read Tara Austen Weaver’s (Tea and Cookies) The Butcher and the Vegetarian, and it had me thinking of my own experiences with vegetarianism. When I was little, my family and I were vegetarian. I remember once when my little sister, who had only eaten vegetarian with us, her family, ate chicken wings at a BBQ, and I flipped – I remember running around in circles, waving my arms around, freaking out to my parents that my sister had just eaten chicken wings, as though it were poison! My parents were very calm about it, they said it was okay, but that was over my head at the time – she’d eaten meat! That was all I was concerned about. Now, I just laugh about it. 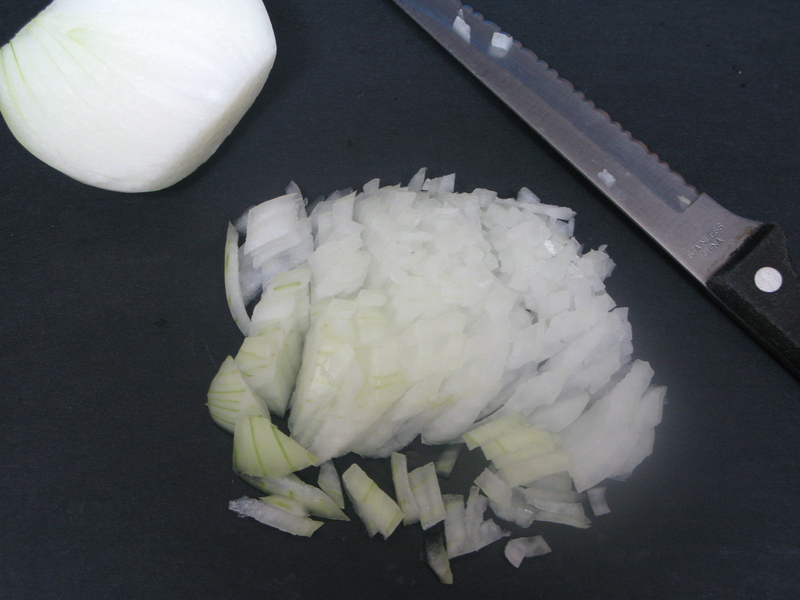 Coming soon: a really nifty way to dice onions that I learned. I think I’d had the intention of making soup when this sauce was created but as I started adding the green curry paste, tasting after each addition, until just right, I changed my mind. It was good just as it was. It tastes like it’s dairy, but it’s just coconut milk. It can be used as a sauce or a kind of gravy, not much is needed. Serve it over rice, or scrambled eggs – or whatever you feel like, where you think it will compliment what you’ve made. Despite the green curry paste used, this is not a spicy sauce at all; it is mild and creamy. This month’s Go Ahead Honey, It’s Gluten Free is all about dairy-free delights. The deadline has been extended to Sunday, June 27th at midnight (PST). If you’re interested in participating or haven’t yet submitted your recipe, click here for details. We hope to see you in the round-up! The amount of the green curry paste is for guidance only; usually, I add a little at a time and taste between each addition. Adjust to your tastes as necessary. Because the beef is cut small, this is a relatively quick sauce to make, it’s finished in about half an hour at most (prep included). 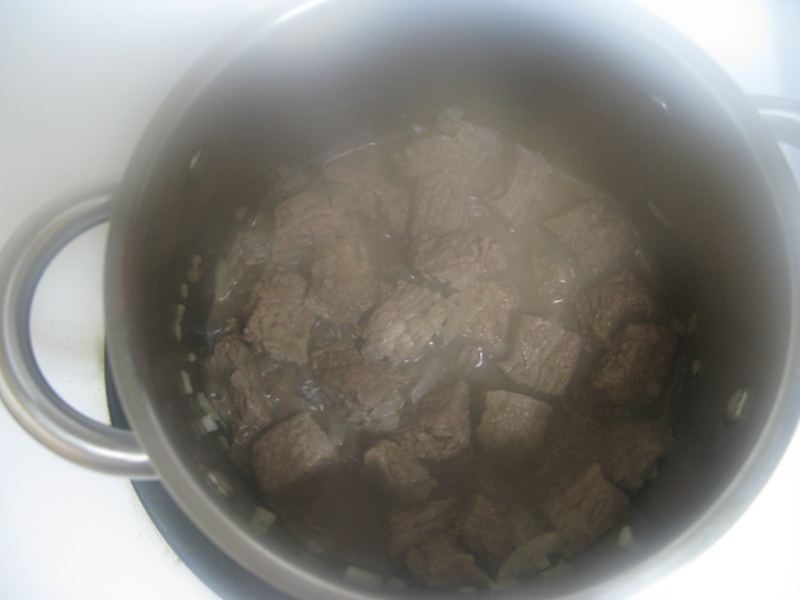 Cut the stewing beef into smaller pieces, about 1/2 to 1 inch. Cook in a small pot until it’s partially cooked. Add the onion, stir, and saute in the beef fat, until onion is soft and translucent and the meat is completely cooked through. Do not throw away the liquid, this helps flavour the sauce. Pour in the coconut milk and stir. Add the green curry paste, adding to taste and adjusting to suit your preferences. 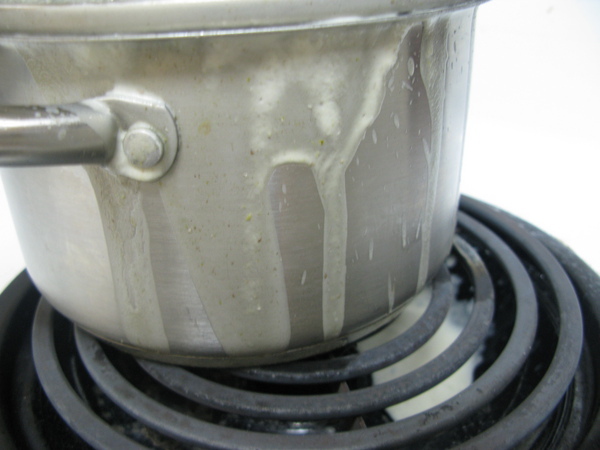 Continue to cook for 5 to 10 minutes longer, uncovered, (if you cover it, it bubbles over and makes a mess if you don’t catch it in time) stirring occasionally. Cool and add salt to taste, or leave it unsalted and let people add their own salt when served. Enjoy! P.S. For all those wondering about if they should read The Butcher and the Vegetarian, I wholeheartedly recommend it! It’s funny, poignant, insightful, sometimes edgy, inspiring, and if anything, it will get you thinking. That’s a hilarious story about you and your sister. 🙂 As for this recipe, how simple and delicious! I love coconut milk – it’s so decadent and feels rich in your mouth. Yum. That is a very cute story. I kind of understand your reaction though, I’ve never eaten beef during my whole life, and if MY sister were to eat it, I am certain it would be the biggest deal to me too. She ate chicken – kind of confusing, since this is a recipe for beef, but anyways. We’re not vegetarian anymore, but we still eat lots of fruits and vegetables. This sounds absolutely marvelous. Love the curry-coconut concept with beef. Yum! This looks great – I don’t eat a lot of meat but this looks so creamy and flavorful! That story about your sister cracks me up! It reminds me of exactly something that my 5 year old would do if he caught his 3 year old little brother eating “gluten”. I think it would give him a full blown anxiety attack! This recipe looks amazing, by the way! I love coconut milk in tons of different savory dishes. My favorite easiest side dish is Thai Coconut Jasmine Rice. Would eat that by the shovel if I could. Will definitely have to try this recipe!